This lighter preparation is perfect for spring. Though we often stir artichokes into dips laden with sour cream and cheese, they deserve a healthier treatment that pays respect to their unique flavor and strong nutrient makeup, including fiber, minerals, and antioxidants. We trimmed and dropped them in lemon water to prevent oxidation before tossing them with seasoned oil and then roasting them alongside lemon halves. 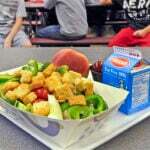 Our vinaigrette included Dijon, garlic, and the nutritious pulp from the roasted lemon halves, which gave it more body. If your artichokes are larger than 8 to 10 ounces, strip away another layer or two of the toughest outer leaves. The tender inner leaves, heart, and stem are entirely edible. To eat the tough outer leaves, use your teeth to scrape the flesh from the underside of each leaf. A rasp-style grater makes quick work of turning the garlic into a paste. These artichokes taste great warm or at room temperature. Adjust oven rack to lower-middle position and heat oven to 475 F. Cut 1 lemon in half, squeeze halves into container filled with 2 quarts water, then add spent halves. Working with 1 artichoke at a time, trim stem to about 3/4 inch and cut off top quarter of artichoke. Break off bottom 3 or 4 rows of tough outer leaves by pulling them downward. Using paring knife, trim outer layer of stem and base, removing any dark green parts. Cut artichoke in half lengthwise, then remove fuzzy choke and any tiny inner purple-tinged leaves using small spoon. Submerge prepped artichokes in lemon water. Coat bottom of 13-by-9-inch baking dish with 1 tablespoon oil. Remove artichokes from lemon water and shake off excess water. Toss artichokes with 2 tablespoons oil, 1/4 teaspoon salt, and pinch pepper; gently rub oil and seasonings between leaves. Arrange artichokes cut side down in prepared dish. Halve remaining 2 lemons crosswise, and arrange cut side up next to artichokes. 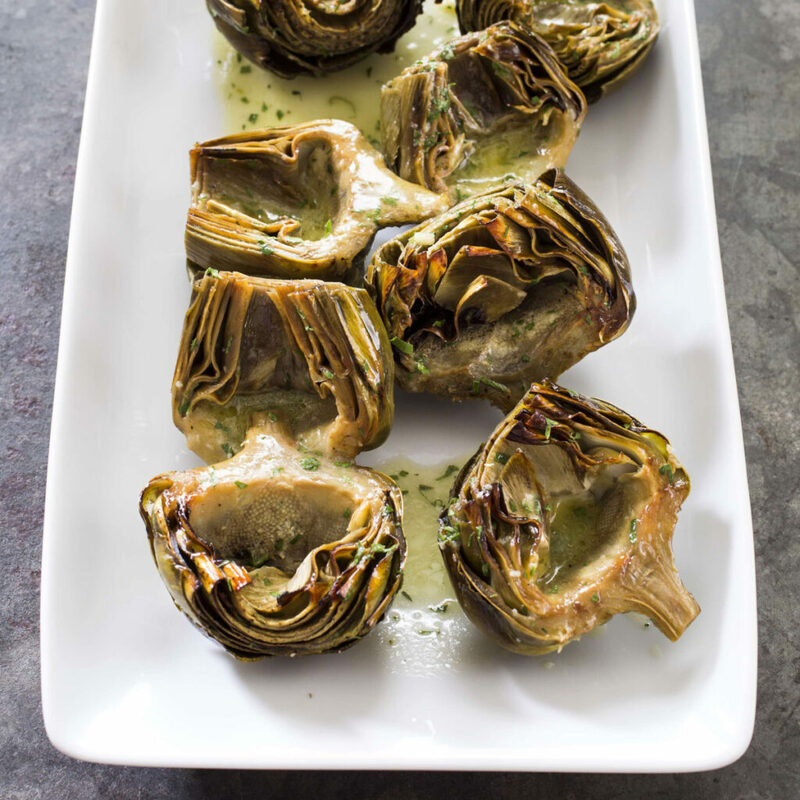 Cover tightly with aluminum foil and roast until cut sides of artichokes begin to brown and bases and leaves are tender when poked with tip of paring knife, 25 to 30 minutes. Transfer artichokes to serving platter. Let lemons cool slightly, then squeeze into fine-mesh strainer set over bowl, extracting as much juice and pulp as possible; press firmly on solids to yield 1 1/2 tablespoons juice. Whisk garlic and mustard into juice. Whisking constantly, slowly drizzle in remaining 6 tablespoons oil until emulsified. Whisk in parsley and season with salt and pepper to taste. Serve artichokes with dressing.